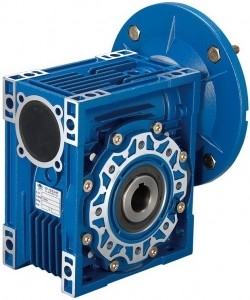 The TNRV series supplied by Euro Drive Systems has two types of housings: Aluminum alloy and cast iron. Two kinds of frames: foot mounting and flange mounting. 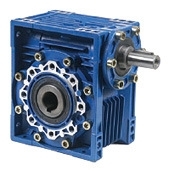 Helical gears constructed of high-tensile alloy material - this makes the unit more compact with higher efficiency and a larger output torque. The gears are high-precision finished with a hardened face: unlikely to distort in service. Additional advantages are: more stable running, low noise and continual running in harsh environment. There are 6 options of output shaft diameter. The TNRV unit can be used in two or three-stage drive transmission. It has a large ratio range - 14 ratios from 5:1 to 200:1. The construction uses high-quality bearings to prolongs the in-service life. The unit can be combined with a three-phase motor, standard single-phase or fully-enclosed aluminium motor - which is waterproof, good heat dissipation and high running efficiency. 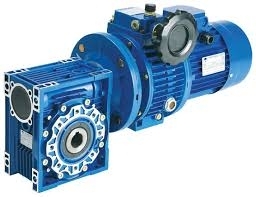 The modular combination extends the transmission ratio from 5:1 to 1400:1.